Marlie has been sick all week with a nasty stomach bug that causes fever and loose stools. She missed two days of school, and I almost lost my sanity. I think I mentioned before that Marlie is a horrible patient. I understand that you are sick, but is that really a reason to be grumpy and whiny and mean? She gets really mean when she's ill. Alas, we survived the week (and each other). By Friday she was semi-normal and asking for paper and pens to draw. After she finished one masterpiece, she jumps up and says, "look, a plane!" I clapped my hands and told her what a magnificent plane it was. 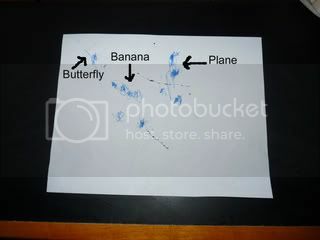 She went back to drawing and came back with a butterfly and a banana. I ooed and awwed again and told her they were beautiful. Then I hung it on the wall. She smiled so hard with pride. Isn't she a genius? What else? Me and the chocolate chip are doing good. I think I am regaining some energy or at least I am not moving like a zombie anymore. I am going to try to start returning emails and exercising this week, but I am not going to overdo it. I hope you start feeling like yourself soon. CC is just trying to get big in there so he's sucking you dry in the process. I LOVE when they draw squiggles and lines and to THEM it actually is what they intended. It's sooooooo cute and definitely worth hanging up. Awesome. Though I have to say that I am looking forward to the first time the Babby draws something an I can see the glimmer of the thing in it. For now, I just pretend. I always melt when i see childrens drawings; its the only way they can show you how they interoperate the world. That's great that she is saying she is drawing things. It seems like kids he age usually just scribble with no intention. You REALLY Didn't Know You Were Pregnant? !